This is a monthly multi-fandom fic writing community. All fic lengths are welcome. 1. This is a community for ficlets and fics of any length, be as long or as short as you want to be. 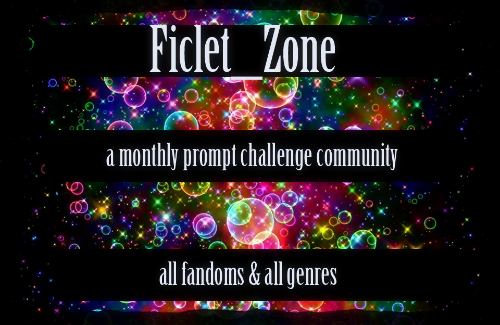 2.	ficlet_zone is a monthly challenge community. There will be a new prompt posted on or around the fifteenth of every month. Challenges will remain open at all times; there are no deadlines, so dip into any challenge that strikes your fancy. Obviously this means there’s no need for Amnesty weeks. 3. 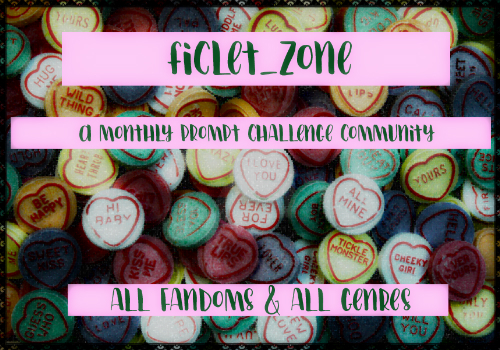 You must be a member of the community to post here, but there is no limit to the number of fics and ficlets you can post for each challenge. Post your fics as entries to the community, NOT as comments to the challenge posts. You can either post direct to the community, or to your own journal wherever it happens to be, with just a header and link posted to the community. 4. Please post ficlets one to a post if posting direct to the community. If you’re linking from elsewhere you can put several in a post, each with its own header if they’re all in the same fandom. When posting direct, please put the body of the post under a cut so that only the header is visible. 5. Please include at least Title, Fandom, Author, Rating, Challenge, and a short summary in your headers. Include Warnings and Spoilers if you feel they’re needed. 6. You DO NOT need to use your prompt word or phrase in your fic. How you use a prompt is entirely up to you. Please note in your header which song or episode title you're using as your prompt though. 7. Please play nice; be polite to fellow writers and the mods. 8. Questions and suggestions for future challenges are welcome on the Questions & Suggestions post. Requests for fandom or other tags can be left on the Tag Request post. Please tag your entry with any tags that apply. These should include at least challenge, rating, and fandom. For crossovers, please use the crossover tag as well as tags for the fandoms used. For RPF, use the rpf tag and one or more fandom tags. I'll be adding fandom tags as needed, so if there's no tag for your fandom, please ask at the 'Tag Requests' post. There is no limit to the number of fandom tags you can request. There will also be tags for slash, femslash, het, gen, under the ‘type’ heading, and for alternate universe, crossover, rpf, and original fic, under the ‘category’ heading. If I'm missing anything essential, please ask at the 'Tag Requests' post. There will be two kinds of challenge, which I hope to alternate. This is where a singer or band will be selected and the titles of any of their songs can be used as the prompt for your fic. Come in and have fun; everybody, and every fandom, is welcome!